Sea cucumbers are echinoderms, the same animal subgroup that includes starfish, sand dollars and sea urchins. 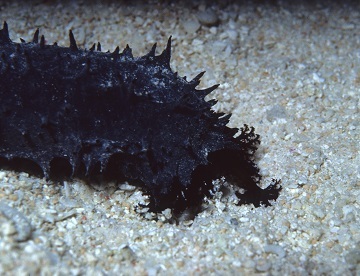 Sea cucumbers don’t have shells for protection, like the other echinoderms. Instead, they shoot out their guts out at predators. But that means they must regrow those organs in order to survive. Scientists at the Chinese Academy of Sciences Institute of Oceanology wanted to know how this organ regeneration is possible, so they sequenced about 30,000 genes of the Japanese sea cucumber, about 92 percent of its entire genome. Then they compared its genetic makeup to genomes of other organisms to learn about the sea cucumber’s evolution. Researchers found that sea cucumbers branched off from other echinoderms about 479 million years ago and have far fewer genes than other echinoderms for turning biological material into hardened mineral. This biomineralization process builds echinoderms’ shells, or exoskeletons. The scientists also identified other genes that no other echinoderms have—probably the ones that allow them to regrow their innards. That brings us one step closer to understanding how these resilient critters regrow their insides — and it may help us learn more about repairing or growing human tissue.